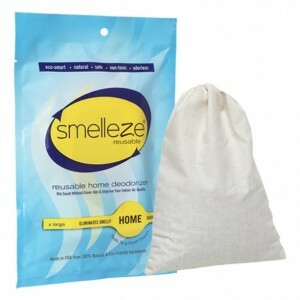 SMELLEZE Reusable Boat Smell Removal Deodorizer Pouch: Destroys Marine Odor Without Fragrances in 150 Sq. Ft.
SMELLEZE Reusable Boat Smell Removal Deodorizer Pouch: Destroys Marine Odor Without Fragrances in 150 Sq. Ft. Summary Smelleze® Reusable Boat Odor Removal Pouch removes boat odor without masking with harmful fragrances. Boat smell doesn't stand a chance. Smelleze™ is reusable & lasts a year. Safe for people, pets & planet. This eco-friendly boat smell removal deodorizer really works to get rid of boat stink! Features & Benefits • Simply place in boat & smell the difference • Eliminates fish, head, gray water, fuel oil, & musty odors • Prevents mold & mildew significantly • Eco-friendly, reusable, safe, non-toxic, odorless • Creates a cleaner, healthier, odor-free environment • Made in USA Is your Boating Pleasure Cut Short by Nasty Odors? As pleasant as your boat or yacht is, it can have embarrassing odors and take away some of the fun on the water. Diesel, bilge, mildew, heads, wastewater, fish, bait, cooking, pet and smoke odors can reduce a glamorous vessel into a boat no one wants to board. 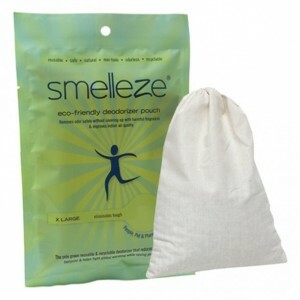 The Smelleze® Boat Odor Removal Pouch was specially developed to eliminate pungent boat and yacht odors on contact without masking them with fragrances. Smelleze® Boat Odor Remover will truly cleanse the air of offensive boat odors while preventing mold and mildew. Using Smelleze® Boat Smell Removal Pouch will result in a fresh, clean smelling boat that will be appreciated by the whole crew. This is sure to enhance your boating pleasure. For a breath of fresh air, simply place or hang the reusable Smelleze® Boat Smell Remover Pouches in your boat or yacht and smell the difference. To rejuvenate periodically, simply heat in a microwave 2-4 minutes or place in direct sunlight for a day and reuse. Replace when rejuvenation does not help. 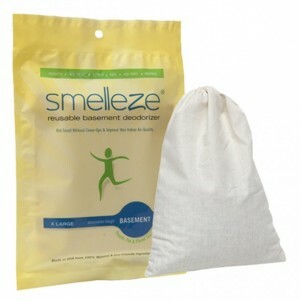 Smelleze® Boat Smell Neutralizer Pouch can work for years so it is very cost effective. Smelleze® Boat Odor Neutralizer Pouch is non-toxic, safe, reusable, recyclable, natural, odorless, non-flammable and non-caustic. It is an ideal environmentally friendly solution for eliminating unpleasant boat and yacht odors without adding pollutants to the air you breathe. Smelleze® Deodorizer Pouch does not contain VOCs, harmful or ozone depleting chemicals and is especially beneficial for those suffering from allergies and chemical sensitivity. No fossil fuels are used in the production of Smelleze® smell eliminator deodorizer media.